The attack to rescue everyone on New Caprica begins. The Galactica encounters four rather than the expected two Cylon Basestars. The end appears in sight but they get help from a welcome but unexpected source. On the planet below, Tyrol and Anders lead the attack to free everyone from the prison. Anders finds Starbuck but she won't leave without Kacey. Her successful return to the Galactica results in mixed emotions. 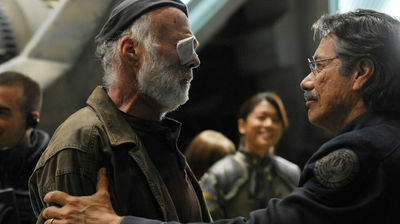 Colonel Tigh must decide what to do about his wife Ellen after she admits to giving the rendezvous coordinates to the Cylons.